The talk on the Campaign Against Home and Water Taxes (CAHWT) at the Anarchist Bookfair 2013 in the Main Hall was relatively sombre in tone to say the least. The echoing clamour of the Main Hall only served to highlight the strange impasse which the campaign has found itself in of late. The assembled survivors could have fitted easily into Room 2, which was packed to capacity by speakers on issues which would seemingly be less of a political immediacy. The speakers Alan and Kevin focused mainly on the recent failures as opposed to the triumphs of the campaign which had by this stage lost significant momentum after a promising zenith around April 2012. Within local campaign groups, the speakers emphasised the need to encourage people to take ownership instead of relying on more experienced leader figures to determine the direction of the campaign. With the coalition threatening to use “draconian measures” to directly steal the tax from bank accounts. It’s hard to know what was achieved by the campaign. The main issue which warned me away from taking part in the campaign in my area was the People Before Profit saturation the group, which proved horribly prescient. It all comes back down to elections, which is an obvious non-runner. The problems of self-promotion and personality crises appear to have exacted a significant toll on the campaign. This is particularly problematic for people who are new to activist politics or aren’t willing to shout down the opposition. A definite schism emerged between those focused on using the tactics of direct action and non-electoral means to advance the campaign and the vocal advocates of electoralism. Those intent of working on the inside of the limited political sphere saw the campaign opportunity to put Labour under pressure and elect single issue candidates to oppose the implementation of the tax. Its opponents viewed this as the inevitable erosion of self-organisation and empowerment that involvement in CAHWT had granted its participants. This approach would inevitably lead to the main focus of CAWHT being the election of candidates, which would logistically limit the time and resources available for other forms of activity. One of the strengths of the campaign was the emergence of strong local organisations and relatively successful attempts to instate direct democratic methods of running meetings. However, these structures were undermined by strong personalities who effectively disregarded them in favour of forwarding their own political agendas. 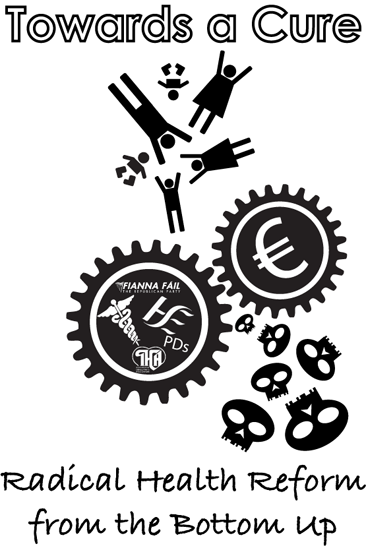 From the speakers accounts of what went on in the local CAHWT groups they were involved, this is exactly what happened in many local groups, the focus of the campaign became dominated by electoralism and the idea of fielding single-issue candidates in the 2014 Local Elections on an anti- Household and water tax proviso. Inexpertly attached to this proposal was the hollow promise that this would merely serve as an adjunct to a campaign of mass resistance and in no way drain the campaign of all energy and enthusiasm. This proved to be a major sticking point, which diverted the attention of the campaign from addressing the wider problems of capitalism beyond the current crisis and of developing links to other groups such as unions, community groups and focusing on direct action based tactics such as non-implementation of the tax. It wasn’t a total failure though as activists managed to facilitate the adoption of non-hierarchical methods of organising and running meetings. Large-scale non-payment was achieved, leading to the scrapping of the erstwhile Household charge in its original guise in favour of the Property Tax circa 2013. The depths of disgrace the enforcers of the tax are supposedly willing to sink to in its implementation is to the credit of CAHWT and shows the strength of the campaign and the fear it has generated in the heart of its enforcers. The solution is unclear but radical and certainly not to be found in the Dail Chambers. Ultimately, the campaign will have to decide to either fully embrace or eschew the electoral route in order to establish a much-needed sense of cohesion both in local CAHWT groups and in the campaign as a whole. However, the former poses inevitable difficulties for the continued involvement in the campaign of those opposed to electoralism. The first edition of the new magazine from the Workers Solidarity Movement, Common Threads. This site archives most material the WSM publishes but there is often a delay of a few days before stories get copied here from our Facebook pages. To see material as we publish it follow us on our main page linked below or if you live in Ireland also via Solidarity Times. Our twitter coverage is different to what appears on our Facebook page and includes highly curated retweets of important international stories. What Happened When Portugal Decriminalised Abortion?